Some time previous to the making of this duvet (perhaps as long as 6 months .. 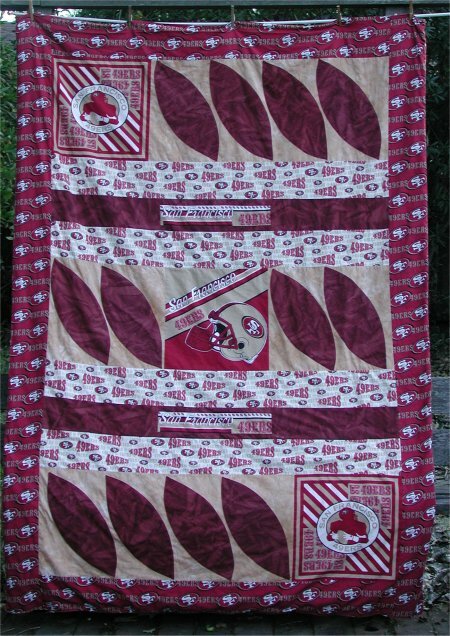 I don't quite remember), I bought some San Francisco 49er fabric for my youngest daugher, Rene, who is a fan of them. She already had a well-worn, store-bought comforter that she liked sleeping under and agreed that instead of an honest-to-goodness quilt from the 49er fabric, a duvet cover would be a good idea. She would get the best of both worlds: to keep the existing, cozy comforter yet get a new 'quilt' with the 49er fabric. I wanted the inside of the duvet to be "clean", i.e. no threads hanging about or exposed seams. After making a row, I sewed each one onto a lightweight foundation fabric with a sew-n-flip technique. I didn't use any filler at all: no batting, no flannel, no nothing, as the existing comforter was going to provide that function. The backing was the logo fabric with the deep red background. To secure the comforter inside the cover, I sewed velcro tabs to the comforter and the cover, which enables me to remove the cover for washing yet keeps the comforter nicely inside the cover. I finished the bottom with red-colored snaps.